Save Time. Stay on Budget. Easily search for wedding photographers by your budget, location and visual style. It's FREE to search, start today! A few of our SnapKnot photographers talk about the importance of wedding ring photos along with some unique ideas for your own. We have pulled together a few of our favorite colors that are perfect for a spring time wedding. Spring has sprung and the time has come for wedding season to begin. So much attention and detail goes into planning every part of the wedding, including picking out the bridesmaid dresses. Today, we are here with some fabulous spring bridesmaid dress ideas! This week are showcasing a stunning floral wedding that took place in sunny California. Marcia and Matt, the lovely couple, chose to hold their big day at The Terrace Willow Glen in San Jose. Surrounded by loved ones, the couple said their vows and celebrated forever together. Are you still looking for a great place to register for your wedding? 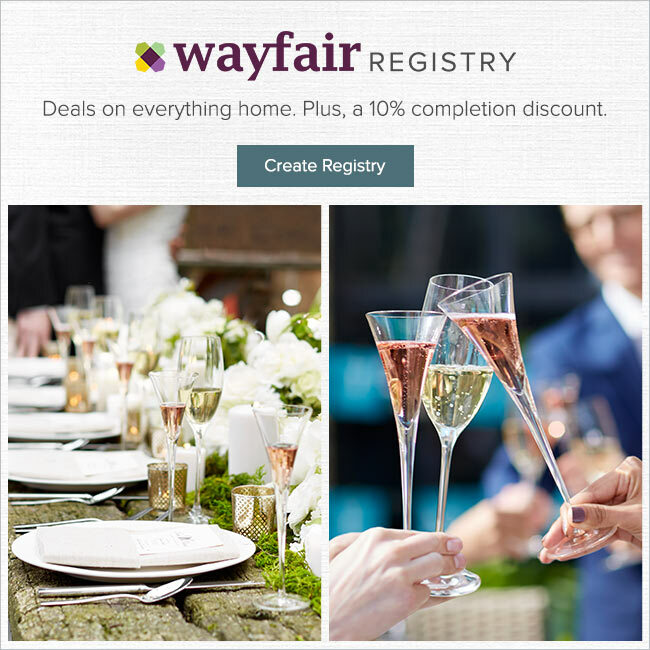 Wayfair Registry has gifts for every aspect of your home from kitchen, dining, bed and bath and outdoors! With millions of products to choose from, you will never run out of registry gift ideas! Getting engaged is just the start of a beautiful and wild ride that you and your fiancé will take. The thought of engagement photos is probably one of the first on things to get done before the big day; so we reached out to some photographers to get some tips they have for the perfect engagement session! From ways to feel comfortable to making sure the pictures are just what you dreamed of, these photographers provided some insight to questions you may not even think to ask. When you are planning your wedding, you want to be sure it is fun and memorable for all your guests….both young and old! The great thing is that there are SO MANY awesome ideas that you can do. Depending on if you are having an outdoor celebration, looking to add a little flair or give the kids something to keep them busy, check out these fun wedding ideas that your guests are sure to love! This week we are showcasing a beautiful farm wedding submitted to us by Alicia from Whole Blossoms. Ashleigh and Michael celebrated their special day in a small town in Maryland. Their day was filled with family, friends, and lots of love. Bello’s Portraits captured all the special moments for the couple and they are stunning! Wedding bouquet compliments shouldn’t just compliment your attire but also something that suits your personality. Sometimes the bouquet itself is beautiful but somehow doesn’t go with the theme or your dress. If you don’t want something clichéd, the best option is DIY wedding bouquets. Creating your own bouquet will add special value to it and you can also customize it just the way you want within a limited budget.